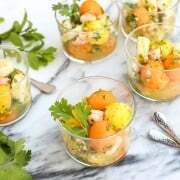 This Tropical Shrimp Salad is fresh and bright, with big flavor, a great recipe for entertaining! It’s been a number of years since I enjoyed my first truly memorable ceviche. Blake and I were in Chicago for a long weekend, celebrating our 10th anniversary. It was our first vacation together sans kids, since our daughters came into our life. And we were set for three days of shopping, exploring, and of course, eating. At the top of our restaurant list was Frontera Grill by Rick Bayless. We came prepared to stand outside in line for more than an hour to be admitted into these walls we’d read so much about. And it was absolutely worth it. Everything about that evening was incredible – the lively atmosphere, intoxicating smells, gorgeous drinks, and Mexican food like I’d never had before in my life. It wasn’t just a dinner. It was an experience. Everything on the menu begged you to order it, to reap the tasty benefits of Mr. Bayless’s extensive travels in Mexico. And this is where I fell for seafood ceviche. The Ceviche Trio appetizer was perfection, a dish I could have easily enjoyed as a light main course. Ever since that weekend, I’ve sought out ceviche on restaurant menus. I’d say I have a bit of an infatuation with it. 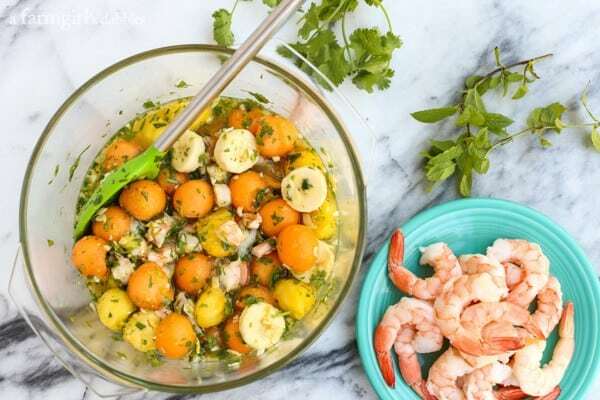 This Tropical Shrimp Salad has many of the same flavors of a typical ceviche, but includes a good amount of fruit that offers a much sweeter experience. It’s a brightly flavored and colored little salad that makes my taste buds giddy. * This post is sponsored by Dole. 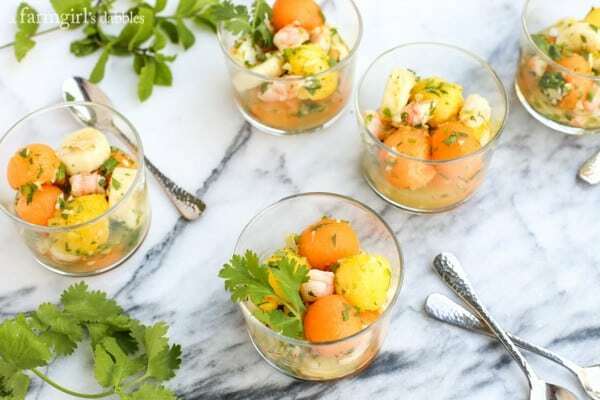 I first enjoyed this tropical shrimp salad a few weeks ago when I visited Charlotte, North Carolina for the first time. I was a guest of Dole, attending their first-ever FRESHFest. Chef Mark Allison, the Director of Culinary Nutrition at the Dole Nutrition Institute, demonstrated how to make this salad. With just one taste, I was hooked! * To read more about my time with Dole in North Carolina, be sure to scroll down past the recipe in this post! The sweet, bright flavors of fresh fruits are the stars of this pretty salad. 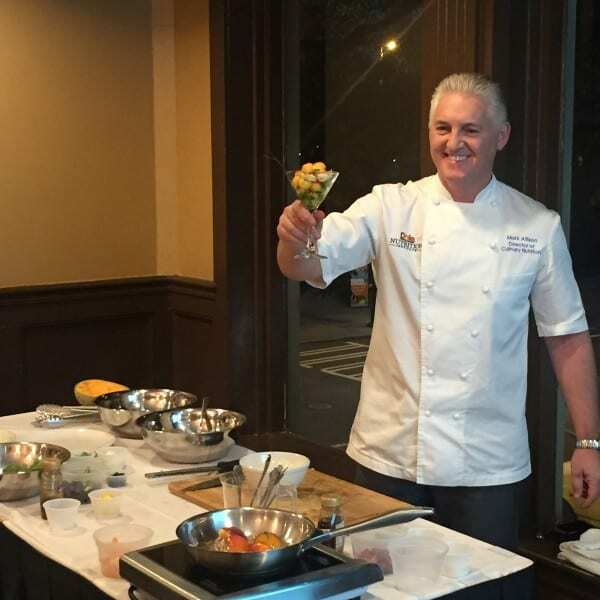 Chef Mark Allison incorporated cantaloupe, plus Dole pineapple and banana into his recipe. Did you know that Dole is the world’s largest banana company? 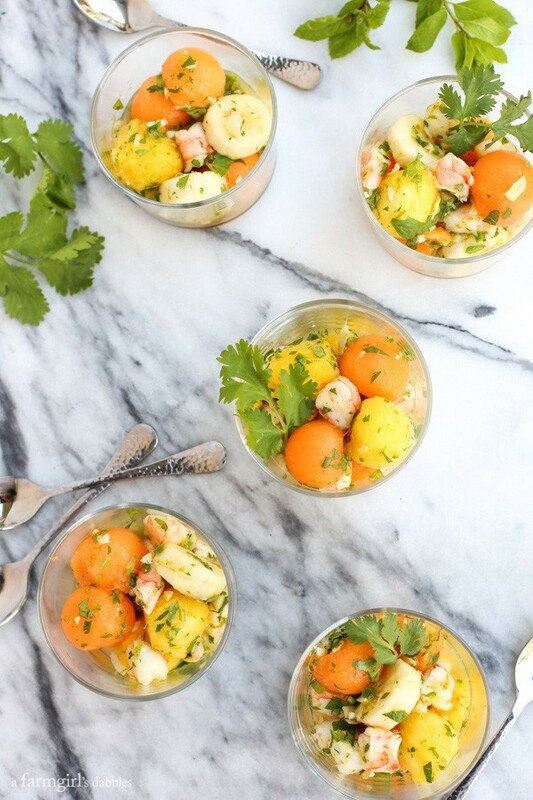 The cantaloupe and pineapple are made into spheres with the help of a melon baller, giving this dish a beautiful presentation. And then shrimp are added. The original recipe calls for leaving the shrimp whole, but I prefer to give them a course chop. I think the salad is easier to eat that way, but use whatever technique you like best. 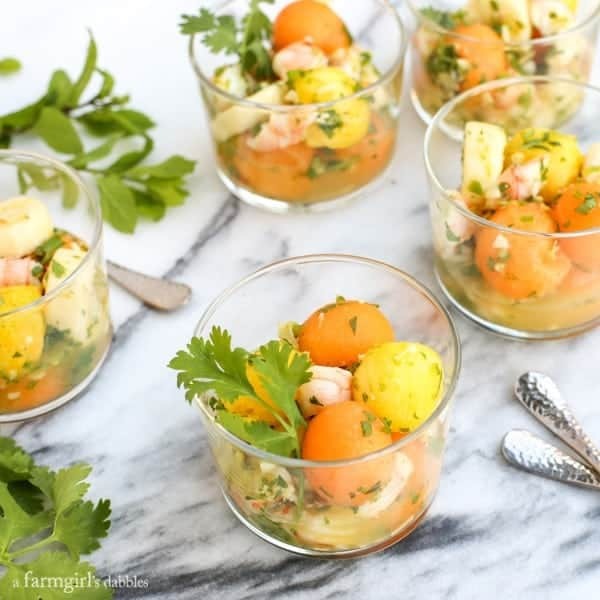 When we enjoyed this tropical shrimp salad in Charlotte, it was served in martini glasses for an elegant presentation. I opted for small clear ramekins here, a bit more casual but still so fun and pretty. This salad is fresh and bright, with big flavor. Holding a little cup of it in your hands, it feels like a special treat that someone spent hours creating for you. But in reality, it’s a dish that comes together in pretty quick fashion. It’s a keeper of a recipe, perfect for entertaining. In a large bowl, combine garlic, honey, fish sauce, juices, zests, and jalapeño. Fold in the shrimp and almonds. 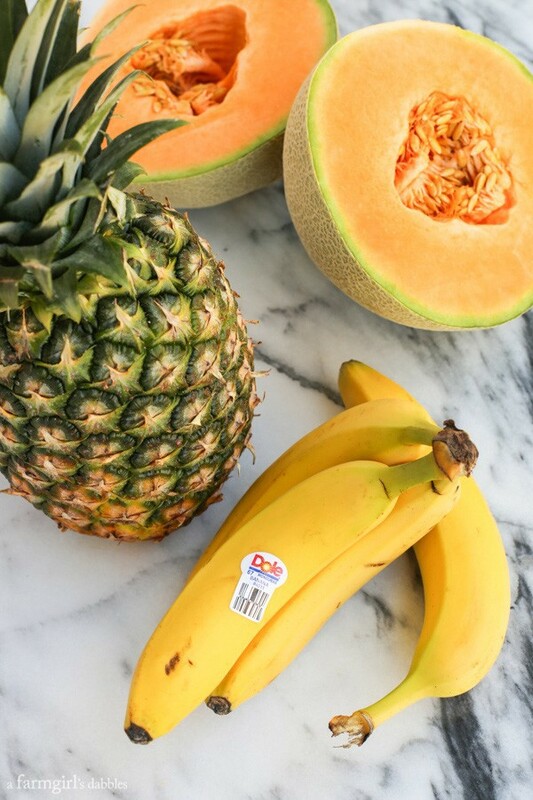 Add melon, pineapple, and banana, stirring to incorporate. Fold in cilantro and mint. Place in refrigerator for 30 minutes to let flavors mingle. Serve in small ramekins or martini glasses. Recipe adapted slightly from the one I enjoyed from Dole, while I was a guest of theirs during #DoleFRESHfest in Charlotte, NC. As part of my ambassadorship with Dole’s Get Up and Grow! initiative this year, I was invited to attend FRESHFest. We had great conversations about the benefits of fruits and vegetables in our diet, nutrition, exercise, and healthy lifestyles. 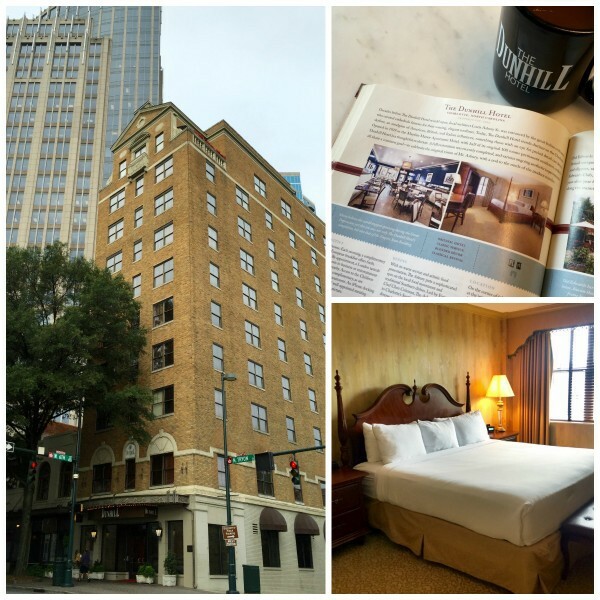 We stayed in the heart of Charlotte’s Uptown, at The Dunhill Hotel. This charming boutique hotel dates back to 1929 and is one of the National Trust for Historic Preservation’s Historic Hotels of America. Many of our gatherings and meals with Dole were held right at The Dunhill. The comfortable, more intimate space suited our group and its events so nicely. 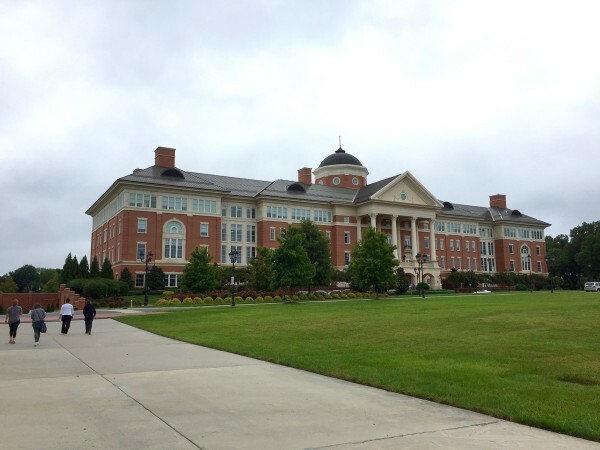 We spent most of a day visiting the Dole Nutrition Institute on the North Carolina Research Campus in Kannapolis, NC, located about 45 minutes northeast of Charlotte. The building shown above is the David H. Murdock Research Institute, named after the owner of Dole. 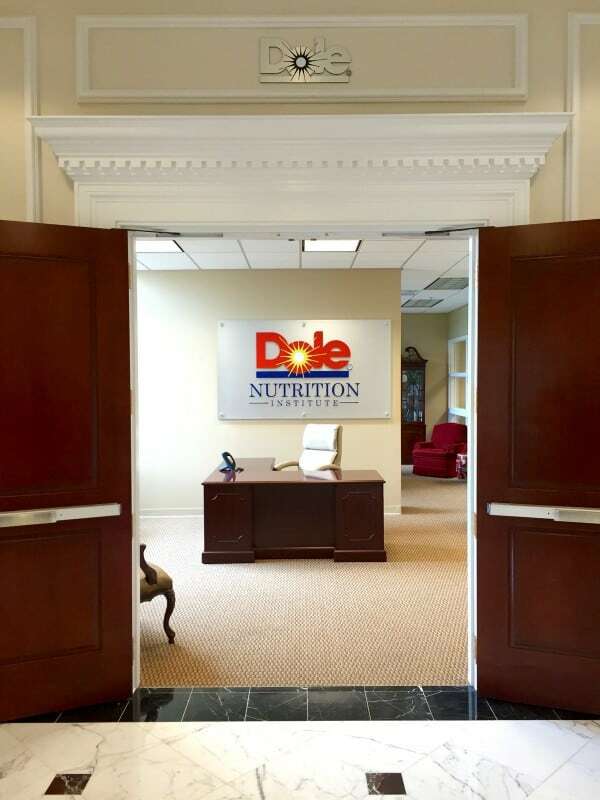 The Dole Nutrition Institute aims to help provide a solid scientific foundation for the benefits of a diet rich in fruits and vegetables, as well as providing more nutritious products and better education to its consumers. This facility employs top scientists and researchers. 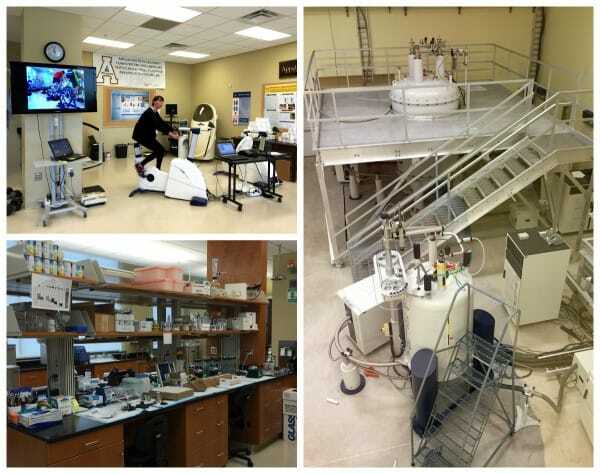 We were taken behind the scenes, into their state-of-the-art labs and research facilities. In the photo on the right, the machine at the top with the platform built around it, is a Bruker 950 Spectrometer. 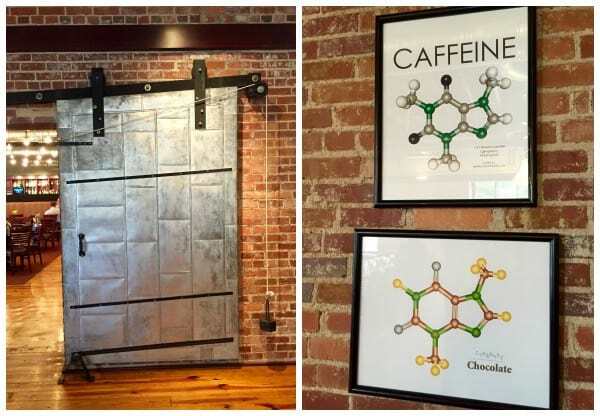 Basically, a two-story, 8-ton magnet that enables scientists to determine molecular structure. It was obvious how proud they were to have this powerful piece of equipment at their disposal. 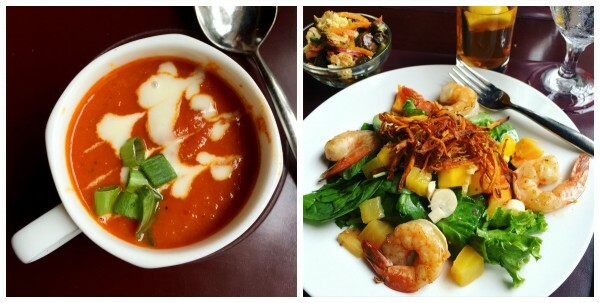 Restaurant Forty Six focuses on healthful choices. My meal was wonderful, with a mug of steaming coconut curry tomato and carrot soup, plus a salad of fresh greens with avocado, mango, papaya, hearts of palm, sweet potato, and roasted beets in a lemon chia vinaigrette. 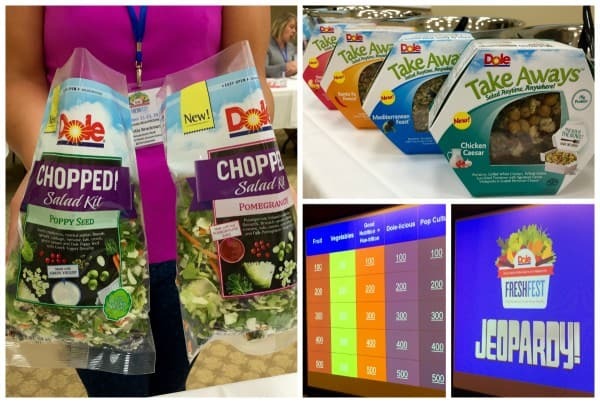 Our group was also introduced to new Dole products, soon to be available to consumers. And we shared lots of laughs after dinner one evening as we played a game of FRESHFest Jeopardy! Before saying farewell, we took in a walking tour of Charlotte. I loved that Dole was thoughtful about giving us a better overall view of this historic city that many of us were visiting for the first time. 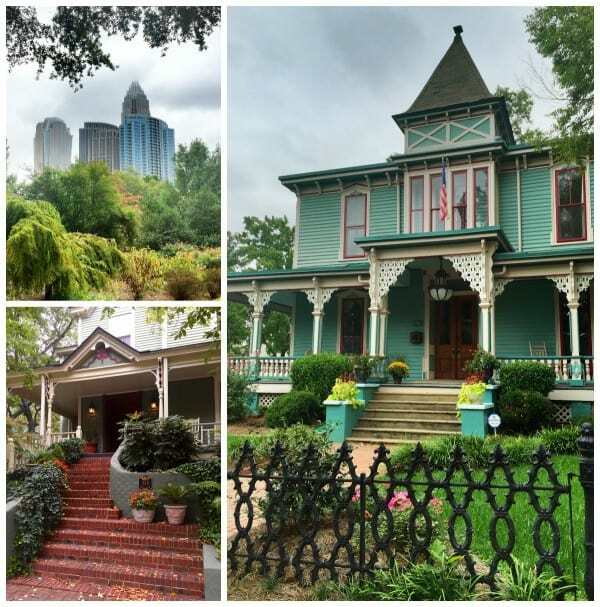 Charlotte is steeped in history, but also very modern. To name just a few notables, it is recognized for its financial and banking businesses, being the major center for NASCAR in the U.S., its incredible number of churches (700+), and being the birthplace of Billy Graham. It was fun to see the old and new colliding so beautifully everywhere we turned. I especially enjoyed walking through a bit of the Fourth Ward residential area, with old Victorians lining the streets. The photo in the upper left corner was taken in the Fourth Ward from a pretty park surrounded by historic homes, some dating back to the 1800’s. 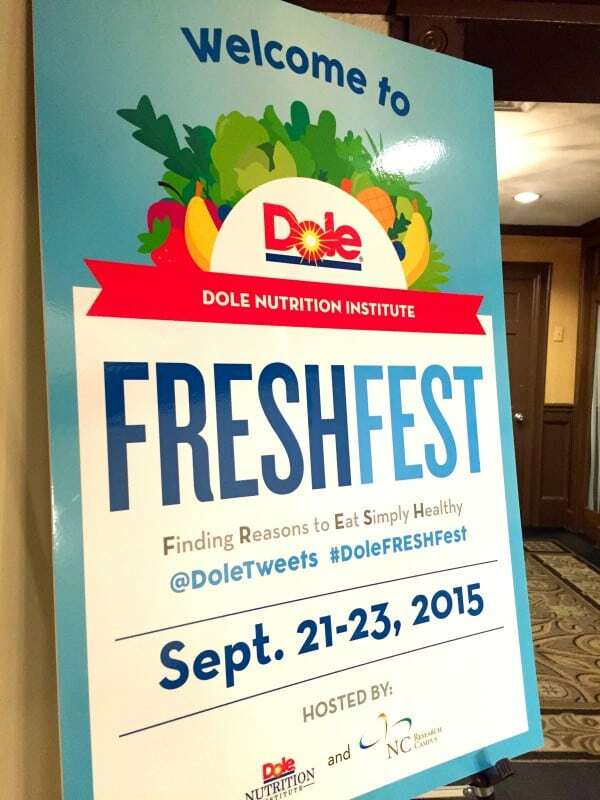 Thank you to Dole for such an interesting and delicious time in Charlotte!